Oh my goodness, I’m swooning over this guest cottage today. What a sweet little house. The only problem would be fighting off all the visitors who wanted to stay here and then convincing them to ever leave, ha. When a family living on Moriches Bay in Westhampton wanted to build a guest house on their property, they hired architect Stuart Disston, who created this adorable shingle-style gambrel cottage for them. The house has two bedrooms and 1,500 square feet. Douglas Graneto Design created a warm and welcoming space for guests. Graneto wanted the interiors to reflect the main house. The kitchen has seating in the bay window, oak floors, and wainscoting on the ceiling and walls. Stuart Disston, AIA, spent childhood summers in Quogue, which gave him an appreciation of classic Shingle Style. The homeowners say they love the cottage so much they’re often tempted to stay in it themselves. I know I would! I don’t see how the top and bottom photos of the small grey cottage is of the same interiors later in the post. There isn’t an arched doorway in the front or back in the exterior photos and the door in the living room photo isn’t what’s in the grey house. Hmmm…not sure how to explain it. Thought maybe one of them got mixed up with main house photos, but I double-checked and these are the photos the designer shows of the cottage, too. Maybe a third entry door we’re not seeing here? I think the living room picture is of the main house – compare the doors. This might be a mix of main and guest house interior shots. No matter – all lovely!!! Another reason I don’t think it’s the same….look at the first picture of the front door. It has the windows down both sides and the cottage doesn’t. The cottage doesn’t have a chimney either but the second house does. Pretty pictures but they don’t match the house. OMG that staircase!! And the oval windows!! And the ceiling designs!! So much beauty in one place!! In Westhampton, New York, on Moriches Bay. Great attention to detail! The watercolor green tiles in the bathroom are so beautiful. Wonder about the ivy design on the walls above — is it wallpaper? Stenciling? Anyway, they had me at that staircase. Lol! Love it! “They had me at the staircase” too! Oh my gosh, that cottage looks beautiful. I would love to stay in a place like Westhampton. Moriches Bay looks like paradise for classic house lovers. I’d take the cottage and give the rest of my family the big house. And then change my locks! This might be my favorite cottage you’ve featured over here, Julia. LOVE it! That staircase is perfect. Thanks for sharing it with us! All of this is lovely, no matter how the pictures are mixed up. The staircase is stunning. Love the living room…such an inviting room. That cottage has an “old” look…it looks like it has been there for years. Yup, I could live in a cottage like this. 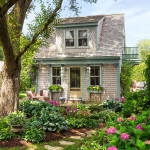 Love that cottage…when can I move in? Oh my the staircase…that is perfection…reminds me of a lighthouse stairway…wow. Love this! It does look like the living room matches the entrance door on the big house. The attention to detail is wonderful. I love everything, including the bath tiles. I’d live there in a heartbeat. I simply love the idea of emphasizing the small details. The ceiling, the staircase. It’s all in the details. That is the most charming guest cottage ever!